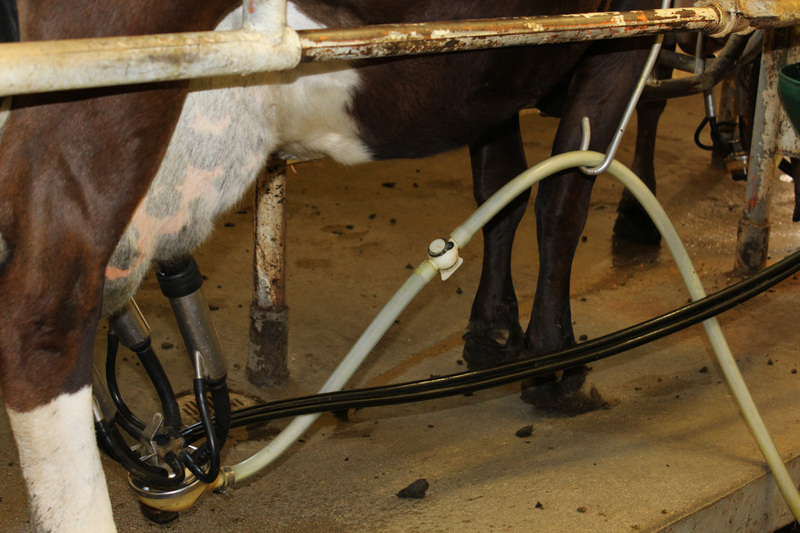 Most of us have been trained throughout our lives that raw milk is not safe to drink. Consider this. Our digestive system is acidic. Grain fed cows have a more acidic digestive system as well. This is not true of cattle that are completely fed on a grass fed diet their entire lives. (We recommend reading “Why Grass Fed is Best” by Jo Robinson or visiting eatwild.com). When acid resistant, pathogenic bacteria from grain fed animals reaches your system, prepare to be very ill. If the same pathogenic bacteria from a grass-fed animal makes it into your food, it’s lack of acid resistance will produce it’s death in your system. This is why, in addition to the nutritional benefits, we feel it is important for raw dairies to be strictly grass fed. Please keep in mind however, studies show that this pathogenic bacteria is much less likely to be present in grass fed cattle in the first place. Our cows are milked once per day in a closed milk system. The milk is stored in a 400 gallon, cooling bulk tank. The milk is bottled unpasteurized and unhomogenized, thus raw. 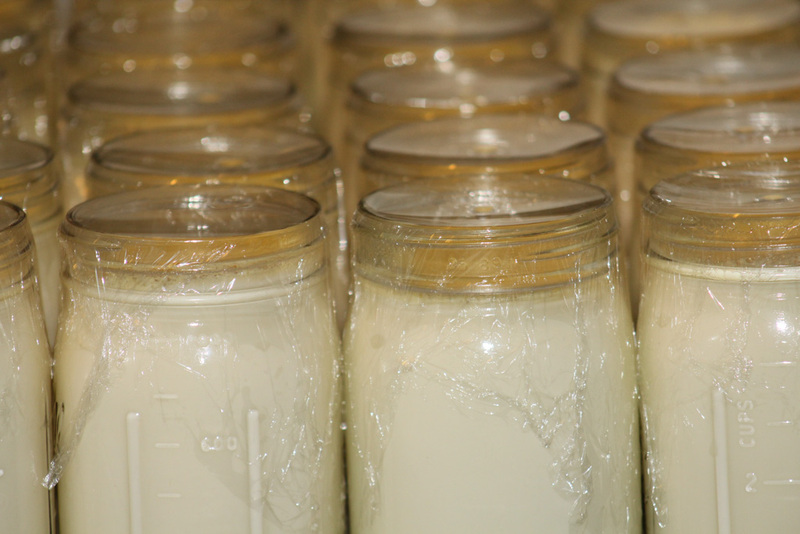 Once bottled in glass jars, the milk is stored in large coolers in a walk in cooler. The large coolers are loaded into a delivery van twice per week and transported to various distribution points. Our herd is about 85 percent Jersey cows. We run a Jersey bull with the cows for breeding. A few of our cows have a bit of Holstein or Guernsey mixed in. We are currently, and plan to maintain a closed herd, meaning we do not plan to introduce cows form outside the herd, but rather raise heifers to replace other cows. The only exception is changing the breeding bull as needed. We are running an A2/A2 bull and have been actively culling out the cows that have the A1 gene. Getting to a 100% A2/A2 herd takes some time as we have about 40 total milk cows, but we are very close and anticipate being 100% A2 in 2018. The Eberts do not allow the use of any hormones on the cows and the cows at Ebert Farms are not vaccinated. The Eberts very rarely use antibiotics to treat cows with serious mastitis or health issues. Milk is always withheld from customer consumption after a cow is treated with antibiotics. Jars used for bottling milk are sanitized in a commercial dishwasher with food-grade hydrogen peroxide instead of traditional chlorinated products. While the dairy is not Certified Organic, the farm ground is. 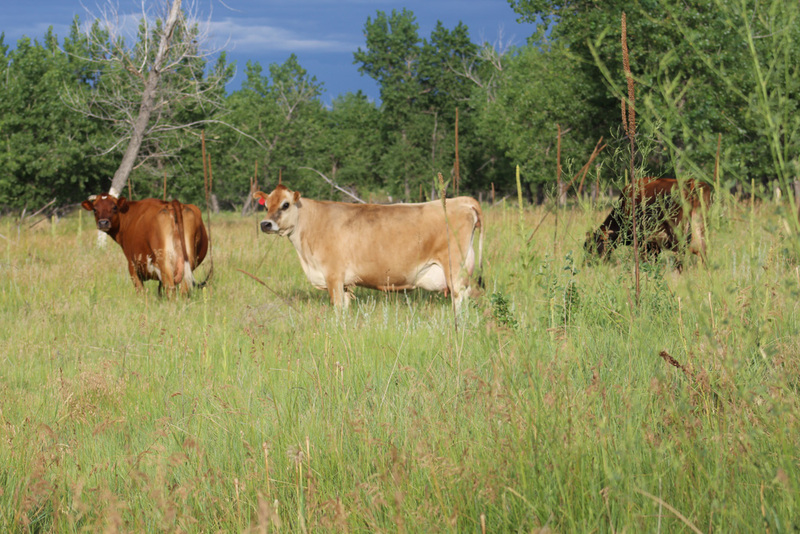 The cows graze all year round on about 640 acres of native grass pasture. The grass would definitely meet organic standards. To entertain the cows during milking, a feed ration is ground at the farm. It contains 85% certified organic alfalfa, 7% palm oil, 5% molasses, and 3% mineral. This ration makes up a small percentage of the gals diet. The rest of their feed comes from native grass pasture which is grazed in both the summer and when possible, the winter. During the winter months, we supplement with certified organic alfalfa that is purchased from neighboring farms. The cows are not fed any grain, ever. The herd will be tuberculosis tested every three years. Any new cow entering the herd will be tested for tuberculosis, brucellosis and Johnes.